Happy Tuesday!!! Do you know what today is?! It’s Alpha Kappa Alpha Sorority Incorporated’s Founders’ Day! We are celebrating 111 years of sisterhood and service to all mankind. Skee-wee to all of my lovely sorors! 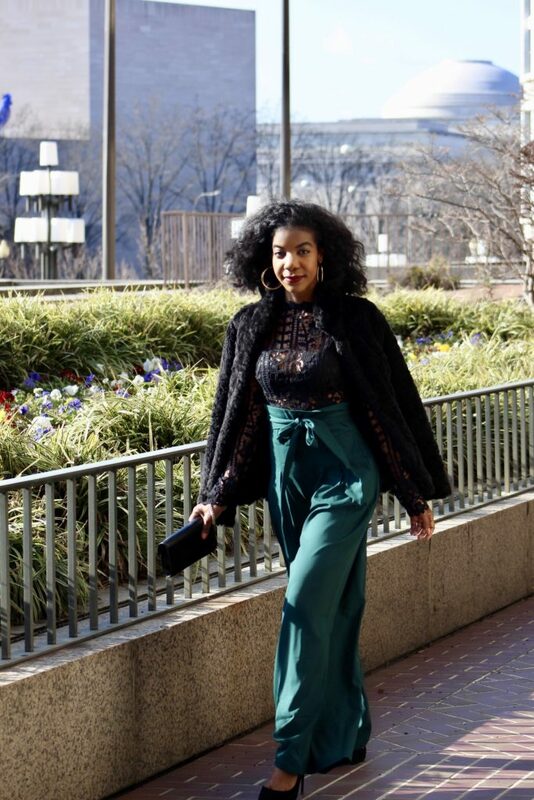 It’s only right that I’m gorgeous in green today rocking this gorgeous pair of palazzo pants from SheIn (use my code “Q1thestyleperk15″ for 15% off of any purchase! I remember when my oldest sister Kristin pledged AKA when she was in college, and I was in elementary school. I thought it was all so cool, and I knew once I got to college, I was going to be an AKA. My mom also pledged when she was in college, though she likes to joke like it’s no big deal, it is a PRETTY big deal! 😉 When I was in high school, my second oldest sister Karen also pledged, further exciting me to become one myself. They all had amazing stories and bonds with their sorority sisters, and once I pledged my sophomore year in college, I was able to join in the legacy. Fun fact, I have three sisters, and we all attended the University of North Carolina at Greensboro. So my two sisters and I were all initiated through the same undergraduate chapter (Notorious Nu Rho)! Let me talk about these pants really quickly! They are everything! The quality is great. and they fit true to size. I did have to pull the waist belt pretty tightly to get them to sit higher up on my waist. I am wearing an XS. Thanks for reading! Are you apart of a sorority? Let me know below! This is such a fly look! I would have never thought to style a sheer top with high waist pants, you look stunning! I love a good green and these pants are GOOD! There aren’t many things I wish I would have done but joining a sorority is one. I love the life long relationships it seems to create. What beautiful lineage for you and your sisters! As well as mom! These pants are definitely a piece I need to add to my wardrobe. Those pants are gorgeous. I love a bold pop of color. It just makes the outfit. Fierce outfit for sure! I am in love with those wide-length pants. I might have to get myself a pair. Love this look. It’s sophisticated with just a hint of sexiness from the lace top. I’ve always been a little envious of the whole college/sorority experience as I joined the military vs. going to college the traditional way. Girl, those pants are everything! I’m all over high waisted bottoms to disguise the mommy pouch so I’m putting these on my wishlist! I love the pants! So different, chic and yet comfy looking. Happy Founders Day. Love the outfit as always.